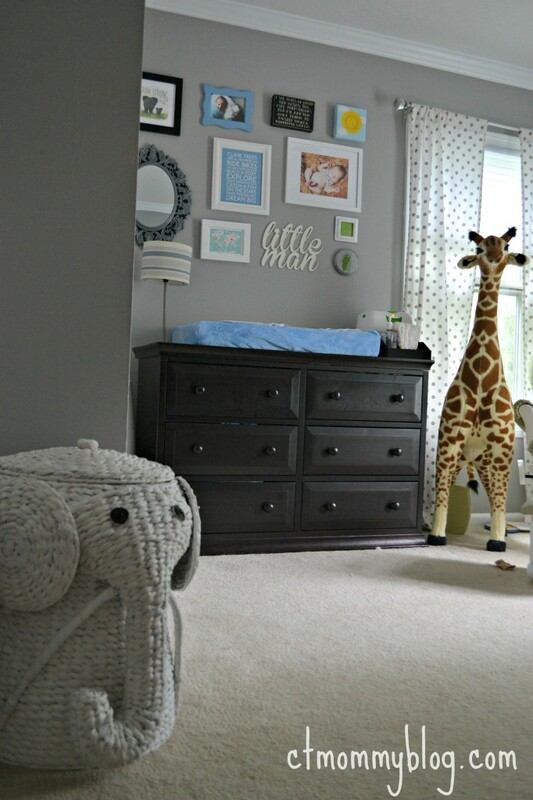 We created a calm and peaceful gray safari nursery using gray striped walls. You can read more about the project on my blog, ctmommyblog.com. Our Pottery Barn Kids Brooks bedding was our design inspiration. It featured the blue, gray, and green colors we wanted to highlight with subtle hints of safari animals. I would describe my decorating style as traditional, but I'm not scared to try new things. I've really wanted to try a gray striped wall and our baby boy's nursery was the perfect place to experiment. I'm so happy with the final product. I love the way the gallery wall came out. It was a labor of love but it really warmed up the room and gave it personality. Our baby loves looking up at all the pictures while he's on the changing table too! Start early and take your time. I gathered my favorite pieces over several months. I am a stay-at-home mom to two-year-old twin girls and a brand new baby boy. I chronicle my journey on my blog, ctmommyblog.com.